OMEGALUX™ SRF cable is ideal for keeping metal and plastic pipes warm in commercial construction, institutional buildings and some industrial freeze protection applications. SRF cable is constructed of a self-regulating polymer core that varies its output along its entire length, saving energy and eliminating hot spots along the pipe. The parallel construction makes it easier to install than zone or series types of cable since it can be cut to length at any point on the pipe. It can be overlapped without overheating the cable. 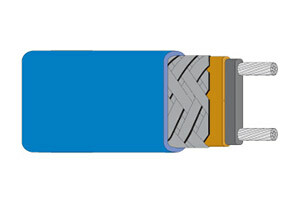 Minimum length of heating cable is 25 ft. See pages B-24 to B-28 for heat cable accessories and controls.